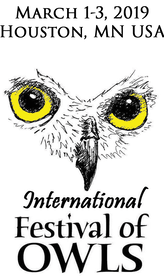 The International Owl Center is once again running their Owl Photography Contest to be judged at the International Festival of Owls in March of this year. The goal of this contest is to share the beauty of owls with the world while having very little to no impact on the owls themselves. Every owl is an individual with different tolerances and every situation is unique, but to this end there are some specific rules to ensure that owls were not significantly stressed in obtaining the images. First prize: US$200, 2nd prize: US$100, 3rd prize: US$50.